The Face Fit Train The Tester Course is suitable for anyone who has the duty to manage RPE procedures in the workplace and wants to conduct face fit testing on their own workforce. Face Fit Training is given by experienced instructors and the course is both engaging and interactive. 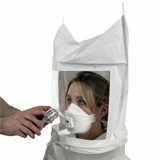 The Respiratory Protective Equipment - Face Fit Train The Tester Course is suitable for anyone who wears respiratory protective equipment on either a frequent or infrequent basis or has the duty to manage RPE procedures in the workplace. Respiratory Protective Equipment (RPE) may be required when working with hazards and protect workers when working with hazardous substances, such as gases, solvents, powdered chemicals and sprays. It is a legal requirement that individuals are face fit tested for tight fitting RPE such as filtering face pieces, half masks, and full face mask respirators that they may be required to use. This course addresses how those requirements apply to regular users of RPE. When Should Face Fit Tester be Carried Out? A Face Fit Test can be carried out in the initial stages of selecting RPE, where an untested face mask is already in use or when the wearer has any significant facial changes (i.e. weight gain or loss, facial hair growth, etc). Face Fit testing does not need to be done annually but it is recommended that face piece wearers receive annual refresher training covering the selection, use & maintenance of their mask. When face masks are issued on an individual basis, it is recommended that they receive an individual assessment on their own face masks. Who are Face Fit Train The Tester Courses for? This course is aimed at persons working with Respiratory Protective Equipment who wish to become face fit testers. How long does the Face Fit Train The Tester Course last? Our Face Fit Train The Tester Course is a half day course.